There is a great deal of similarity between public management challenges confronting countries across the globe. While countries may differ in size and levels of socio-economic development, they seem to have remarkably similar barriers to improving their governments’ performance. They may express it in different languages and with a different style of presentation, but they ultimately mean the same thing. Having worked in diagnosing public management problems in more than thirty countries, indeed, it often appears that public officials in these countries are coordinating (if not colluding) with each other to tell us the exact same story. Every single time in the middle of a diagnostic conversation, I have had an incredible feeling of déjà vu. The good news is, however, not only are the public management problems similar, but alson are the best-practice solutions to overcome them are also remarkably transcendental in their relevance and applicability. In this column I summarize the common barriers to good performance in government and highlight some tried and tested strategies to overcome these barriers. Barrier to good performance in government can be divided into two broad categories: (1) Institutional Barriers and (2) Technical barriers. 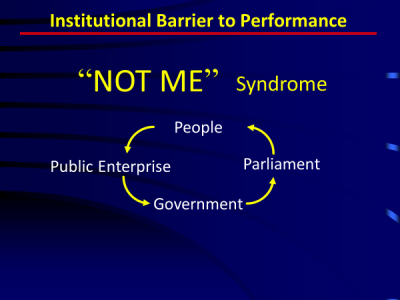 Most governments suffer from two types of institutional barriers. Departments are under scrutiny by multiple principals who often have multiple objectives that are often conflicting. Government departments and agencies in most countries typically report to the finance ministry, parliament, supreme audit authority, courts, administrative ministry, and have to respond to queries from media, think tanks and international agencies and organizations. Everyone feels they have a right to question and supervise the government agency on behalf of the citizens. This should be fine. After all, in the private sector, managers must respond to a large number of shareholders. Alas, there is a big difference between the two. In the private sector all shareholders have the same objective – maximize the bottom line profit. Whereas, as mentioned above, in the public sector, principals (stakeholders) have different objectives and bottom lines. That is why managers in government often do not know what exactly is expected from them. Whatever they do, they are likely to be questioned by another stakeholder with a different goal in mind. Similarly, several important initiatives have fractured responsibilities for implementation and hence accountability for results is diluted. For example, e-governance initiatives in India were at one time being led by the Department of Electronics and Information Technology, Department of Administrative Reforms and Public Grievances, National Informatic Center (NIC) under Department of Electronics and Information Technology, as well as individual ministries. Thus, it was very difficult to hold any one department accountable for any lapses or explain slow progress in implementation of an agreed national strategy. This led to a commonly observed phenomenon of “Not Me Syndrome” in which every department passed the buck to another department. Some of the performance management systems are selective in their coverage and report on performance with a significant time-lag. For example, the comprehensive Performance Audit reports of the Indian Comptroller and Auditor General (CAG) are restricted to a small group of schemes and institutions (only 14 such reports were laid before the Parliament in 2008) and come out with a substantial lag. Often, by the time these reports are produced, both the management and the issues facing the institutions change. The reports of enquiry commissions and special committees set- up to examine performance of Government Departments, schemes and programs suffer from similar limitations. 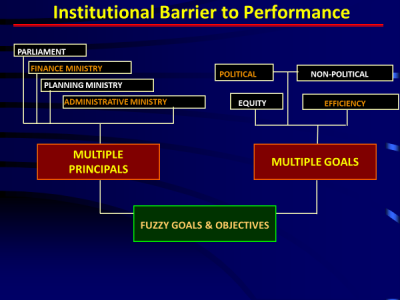 Solution to Overcome Institutional Barrier These three institutional barriers to improving performance can be overcome by implementing a system of Performance Agreements in the government. Typically, a Performance Agreement is an agreement between a Minister representing the Government (the Principal) and Permanent Secretary representing the department (the Agent). These Performance Agreements represent a unified view of what is expected by Principal from the agents. It reduces the fuzziness created by multiple principals with multiple objectives supervising the agent. It also, makes it impossible to pass the buck at the end of the year. Lack of agreement on what constitutes the bottom-line in government represents the biggest challenge facing governments world-wide. Quite simply, if we cannot measure “performance” then how do we know what we are doing is improving performance. What gets measured, get managed. ● Define “performance” as delivering what was agreed at the beginning of the year. ● Agree on how to measure deviations from the agreed targets. Defines various levels of performance – Excellent, Very Good, Average, Fair and Poor. Very nice and interesting article. Unless you coordinate from one area to most aspects of a government, you cannot get much done and taxes go up more than necessary along with frustration for the general public.